Tom practices in the field of commercial real estate and has extensive experience representing lenders in the origination and syndication of construction loans, permanent loans, portfolio loans and mezzanine debt, as well as asset acquisitions and dispositions, including sale-leasebacks, and the negotiation of ground leases and leases of office, industrial and retail properties. Counsel to the owners of a prominent midtown Manhattan office building in the negotiation of leases and licensing agreements. Counsel to a construction equipment franchise dealer (located in New York/Connecticut) in all phases of real estate operations and financing transactions, including the negotiation of a $200,000,000 revolving line of credit facility with a major banking institution, as well as a ground lease of a Hartford, CT building. Counsel on a lease for a retail branch of a prominent bank within Rockefeller Center. Counsel on the sublease of a Rockefeller Center headquarters for a Fortune 100 company. Counsel on a lease with the Port Authority of New York and New Jersey for a prominent entertainment venue within the World Trade Center. Counsel on numerous forms of office leasing agreements for owners of office buildings throughout Long Island and New Jersey. Counsel to an international German manufacturing company in the negotiation of leases around the country. 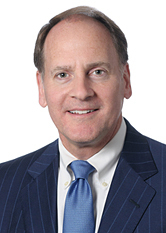 Counsel to a prominent national bank, serving as lender and agent, in connection with a $124 million syndicated credit facility to a joint venture consisting of subsidiaries of a publicly-traded national homebuilder and a global asset manager, for the construction of a 30-story, 113 unit luxury condominium building containing ground floor retail located in Sutton Place, Manhattan. Counsel to a major regional bank in the financing of construction projects under development in both the New York City and Connecticut. Counsel to a Fortune 500 company in the sale of several conference centers. Counsel to a commercial real estate development and financing firm in the negotiation of its NYC headquarters office lease. Counsel to a Fortune 500 technology company in the sale of its New York City headquarters. Counsel to a major Wall Street investment bank in numerous financings involving both senior and mezzanine debt secured by residential, commercial and hotel assets. Counsel to a national commercial bank in providing leasehold mortgage construction financing for a retail development in mid-town Manhattan. At St. John's University School of Law, Mr. Banahan was a St. Thomas More Scholar.